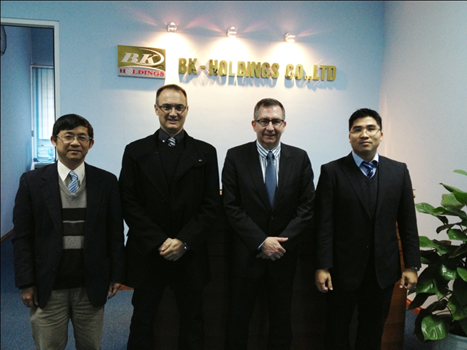 On the morning 22nd February2013, the leadership of INPG Enterprise SA including Prof. H.M Michaud – CEO and Prof. Eric Zamai – Deputy Director of Southeast Asia region met to visit and work with the leadership of BK – Holdings. Representatives of BK – Holdings including Associate Prof. Tran Van Binh – Chairman of the Boards of BK-Holdings and Mr.Nguyen Trung Dung – General Director of BK – Holdings. During the meeting, the two parties have shared the company model, the areas of operation and partnership opportunities. Mr. H.M Michaud shared that IESA Enterprise operates in 3 main areas: research, consulting for industrial companies; promoting the development and business based on the research of Grenoble Institute of Technology; Venture capital. The capital is 1.5 million euro, the annual turnover reached 6 million euro and more than 120 customers in all over the world. At present, the major market of IESA Company is USA; the strategic market is Southeast Asia. BK – Holdings is the first collaboration company of IESA in Southeast Asia. Mr. Nguyen Trung Dung said that BK – Holdings and IESA also are the company belonging to large university Hanoi University of Science and Technology and Grenobale Institute of Technology, so that both companies also have similarities and advantages of development. For the potential of two companies and the relationship between two universities, Mr. Nguyen Trung Dung believes that the leadership of two companies will find out the model of cooperation and efficiency of two sides. Ending of the meeting, Mr. Nguyen Trung Dung led the delegation to visit the office of BK-Holdings and member units of BK-Holdings.